Copyright © 2017 Shopsmith All rights reserved. Store your other woodworking machines and worktables where you need them, then roll them out to go to work! 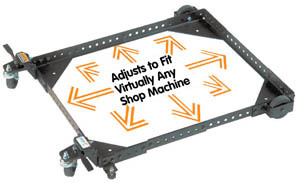 This mobile base lets you move machines and equipment of all sizes efficiently and effortlessly around your workshop. You can work with machines and worktables, then move them out of the way when they�re not in use to conserve valuable floor space. Just place your tools and worktables on these bases, and roll them out when you need them. Maximize your shop floor space while making clean-up a snap! The base expands from a 12-inch x 12-inch square to a 36-inch x 36-inch square, or a 20-inch x 52-inch rectangle. The four 12-inch and four 18-inch side rails, with holes spaced every 1-inch let you adjust the base to fit your needs easier than ever. The Universal Mobile Base utilizes a 4-wheel design with heavy-duty 3-inch diameter wheels, and adjustable rubber leveling feet. This base can support up to 400 pounds. This tool base is manufactured in the USA and backed by a Lifetime Warranty.